Here is a case of Maggots and Worms and VERMICULITE INFESTATIONS THAT CAME FROM ANIMAL TO MAN ‘ the example is given below . The case belongs to a 76 years Christian Old lady, living in Kanpur shahar area. I am treating this lady since 14 years, for the problems she have off and on during change of weather every year several times. She is bulky in body get up and is heavy in weight. Last year at beginning of Winter she suffered very badly by Spasmodic Asthamatic attacks several times a day and her condition was very poor at that when I went to see her. Earlier she was treated by Allopathic remedies but without any result and one day she refused to take the Allopathic remedies. This was the point when her husband call me to see and check her. 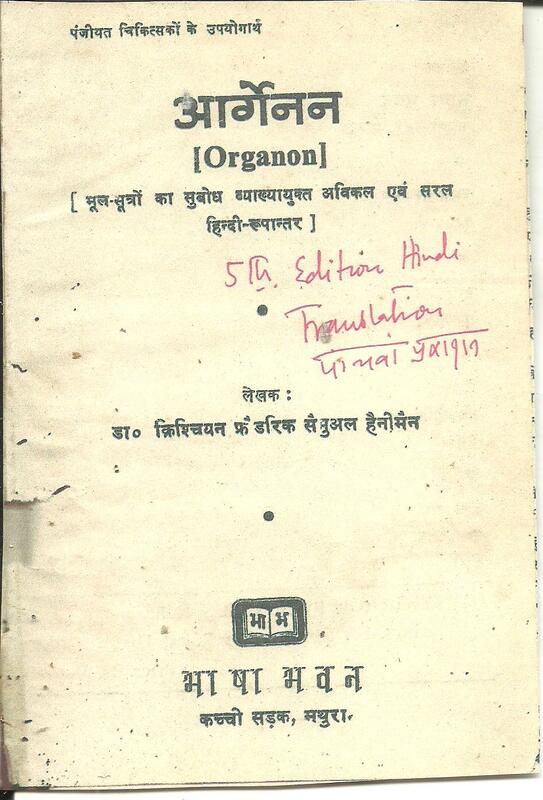 I went and all exminations which was possible at bed side, I done and wrote a prescription of HOMOEOPATHIC REMEDIES. After two days treatment she got tremendous response from Homoeopathic prescribed remedies and after one week HOMOEOPATHIC REMEDIES treatment see got alright. In January 2015 she again got an attack of Asthama this time I again examined her and one day I examined her by ETG AYURVEDASCAN VISUAL MONITOR system . She was almost OK except HIGH BLOOD PRESSURE and POOR OXYGENATION. I examined her LUNGS by HD FONO device, which gave me some unusual interpretations which I never seen and observed before. 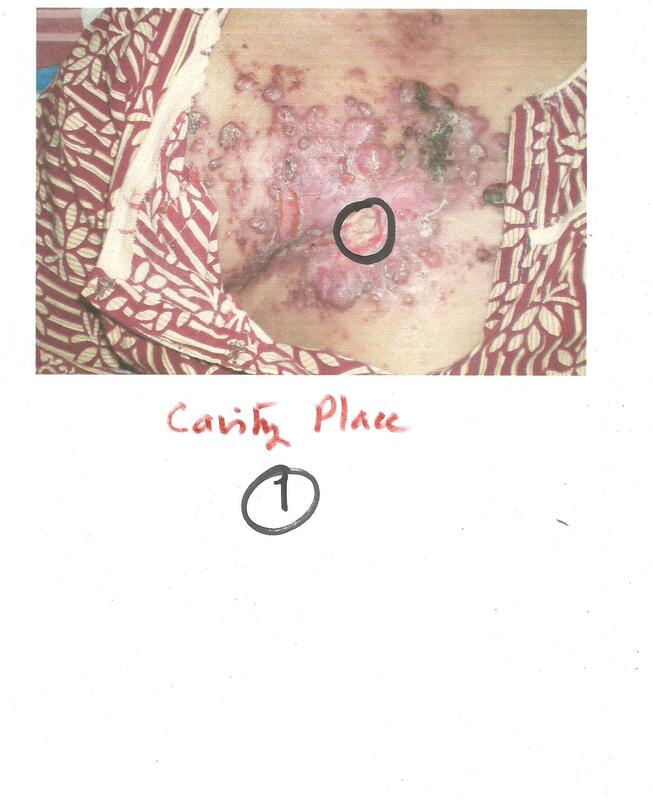 While I was examining her chest I saw inflammatory condition of upper chest skin as you are seeing in below photos. 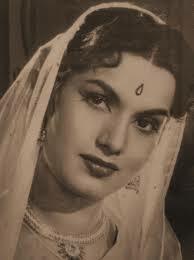 At this time of examination her grandson was with me and was helping me to open the chest area where I want to examine. Seeing condition of skin I thought that she might have asked to her family members about the complaints and therfore I was in confusion that every member of her family knows about the skin problem she have. I never asked about the skin problem from patient or her family members. This was the time when it came this problem in the notice of whole family members that she is suffering with another problems of skin. She have two daughters living with her. Grandson told about the probelm when I went from patient house. In evening patients husband phoned me and ask me to come immediately and check her whole chest including Mammmery glands. Her one of Son in Law is a pathologist and the massage of the problem conveyed to the son in law. I went again to patient.s house with all my armaments / machines of diagnoses , which I have with me and I checked her chest and related organs . They were suspected for CANCER but after examining in primery level , I declared that it is not Cancerous problem , but it could be some other one, which I have to detect. Meanwhile I advised her family to go for entire Bloos examinations TLC, DLC, Hb percentage, ESR, SGPT, Alkaline Phosphates, Serum Bilirubin, SGOT , Creatinine, sodium, pottasium and other examinations. To my surprise, when I received report , all parameters were within normal limits. Xray was done and this was also not showed any abnormal. In between I started treatment by HOMOEOPATHIC REMEDIES. An external use combination of Homoeopathic remedies CALENDULA MOTHER TINCTURE and CANTHERIS MOTHER TINCTURE and HYDRASTIS MOTHER TINCTURE and ECHINESIA MOTHER TINCTURE prepared and instructed to apply on the wounded / Ulcer areas / parts. The similar combination is instructed to use as a washing lotion to clean the skin affected several times a day for healing purposes. A combination of Homoeopathic medicines prescribed to take internally for curing purposes. 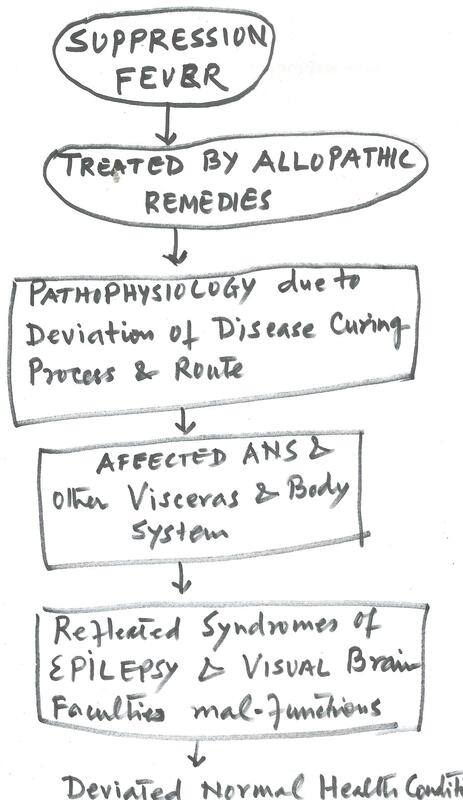 Some symptomatically selected Homoeopathic remedies was prescribed in appropriate interval and repetition timings. Patient improved day by day and her attacks of Asthma minimizes day by day and improved. Her Oxygen level was down to 72 percent. 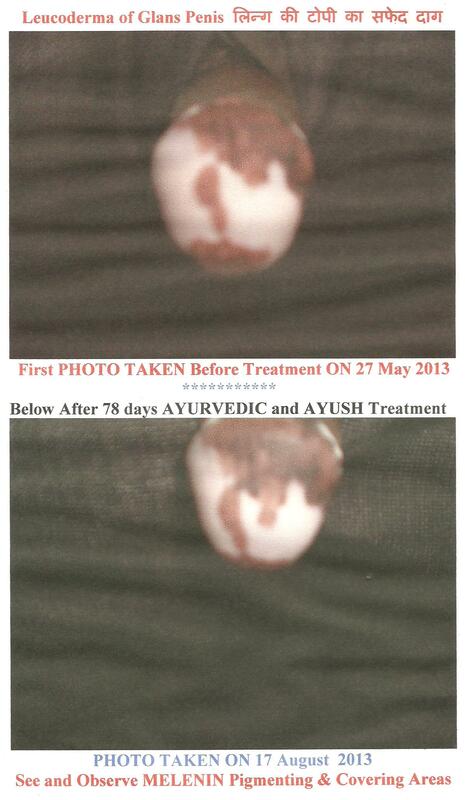 which improved after 15 days treatment upto 92 percent Skin Ulcers healed and pus was almost siezed. The inflammation area which was spread earlier 8″ to 10 inch area, shortens to 6″ by 8″. Thick scabs automatically removed as dead skin. 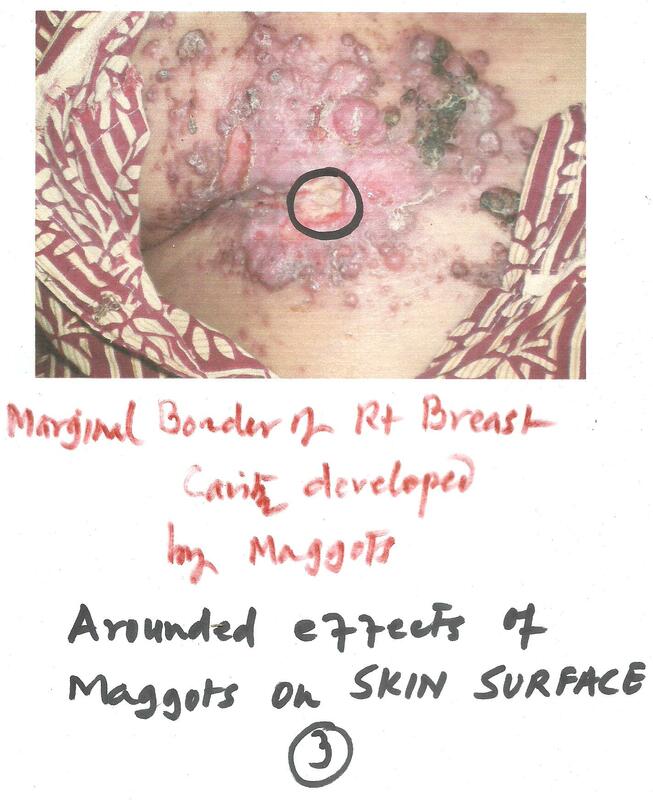 Fresh skin crops up secondary, Inflammation somehow present but the actual reason was not known still. Slowly and gradually patient was improving. At the commencements of Summer season, her Respiratory problems gone because of Heat atmosphere. AYURVEDA tells that KAPHA which is accumulated during winter season due to cold / severe cold and causes bodily ailments , relieved in Summer Heat due to PITTA, which aggravates in Summer Heat. This was the season which relieves the Asthma problem of the aged lady. Her physical and mental condition was improoving tremendously and she was seeing TV and other physical activities in her drawing room and enjoing food and drinks with her family members. I advised her to carry HOMOEOPATHIC REMEDIES especially prescribed on her individual problems and disease condition. 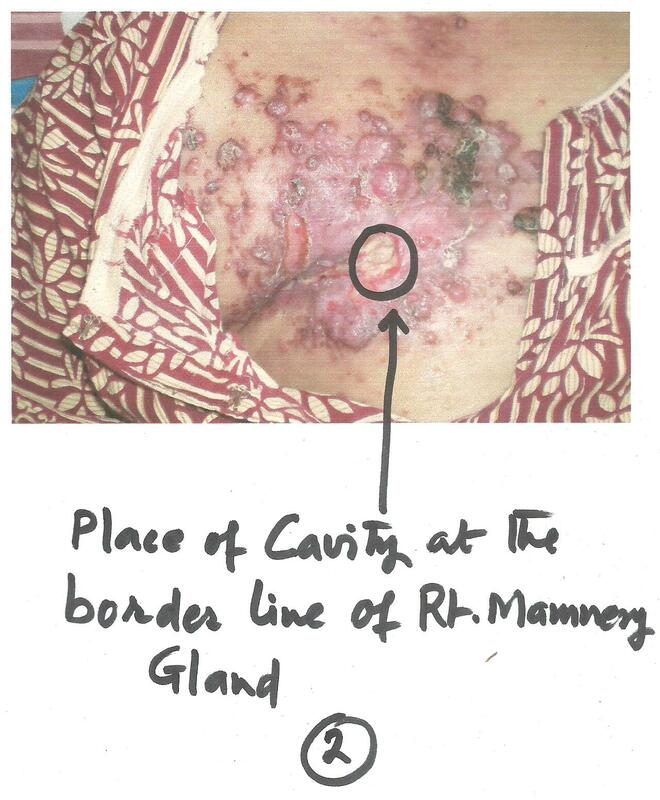 She was also improoving his skin problems which was now reduced upto 60 percent and was healing. 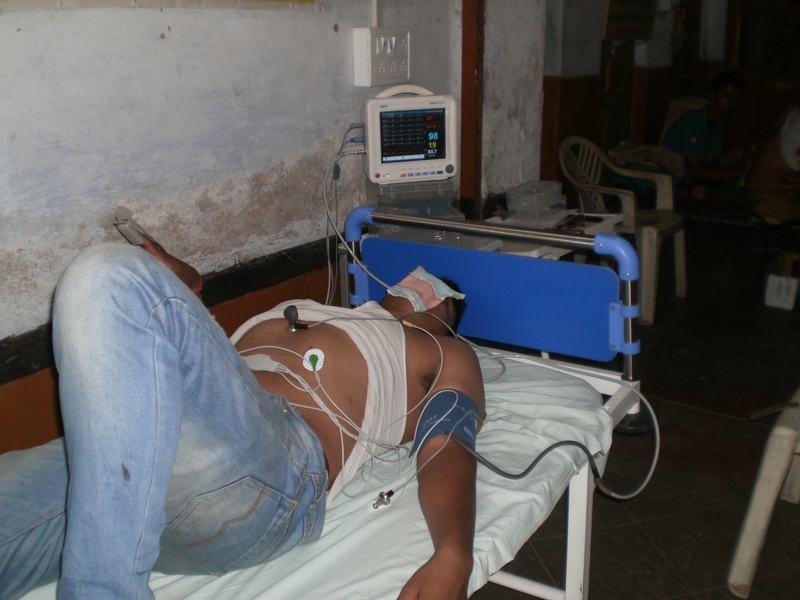 On July 12th 2015 , I was in RAIBARREILLY, UP STATE, WHERE I WAS EXAMINING PATIENT in an out door clinic, phone of lady husaband came and he asked me to come immediately, bur I replied that I am away from Kanpur about over 90 kilometers and cannot come immediately. On asking what happened and the problem, he only narrated that some living maggots are seen in chest at the margin of mammery glands, trying to come out. I told him that he must watch the situation and have contact to me , when in need. Next day morning Lady Husband called me to see patient, as it is an emergent condition. I went and see the situation. As soon as the creature came out the wall of the cavity suddenly bursted and a large numbers of the maggots spreads in her chest and clothes and on cot and cloths and on Floor , All were creeping very fastlyhere and there and ware trying to hide in furnitures and other places. Seeing this the family meners tried to kill the maggots by any way but unfortunately they could not kill, lastly they used PETROL , sprikled a large quantity of petrol on worms and then they could kill. I examined the patient and told the family members that I want some specimen of the maggots for identification. They provided me and a small clips of the worms, which is loaded earlier, can be seen lively in video capturs. What I observed , the family is keeping abour 14 dogs, who live with the family members. I remember that some dogs were affected by the wounds and small wounds. In my opinion, the transaction of the infection route will be by the touch of the dogs and a small maggot could be left at the site. 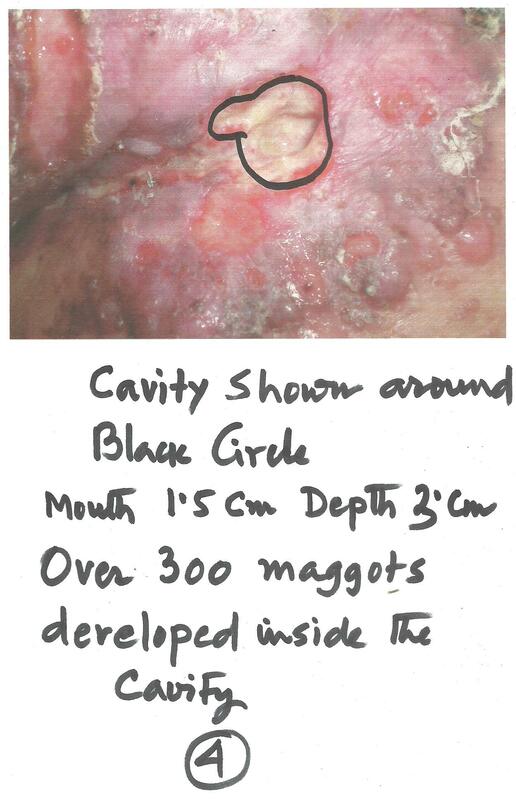 The maggot can live only on the flesh and blood. Some species live on Blood and on flesh. Some parasites are cultured on blood and flesh medium in Laboratory. 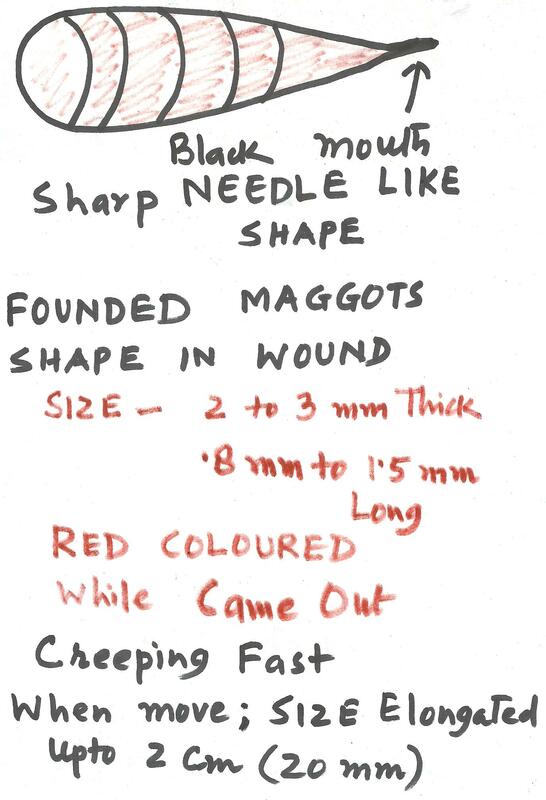 These maggots have a needle like mouth and sharp shap in front and back is bulky comparatively. 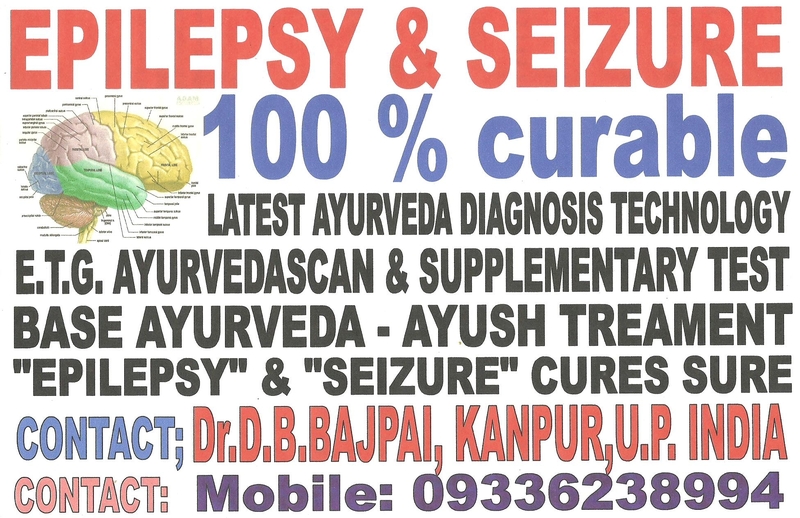 IN OUR RESEARCH CENTER , WE HAVE CURED A LARGE NUMBER OF AVASCULAR NECROSIS PATIENTSWITH SUCCESS BY AYURVEDA AND ITS RELATED MANAGEMENT AND ETG AYURVEDASCAN BASES FINDINGS. BELOW IS A SHORT INTERVIEW OF AN AVASCULAR NECROSIS PATIENT WHO CURED BY OUR TREATMENT. LISTEN HIM. 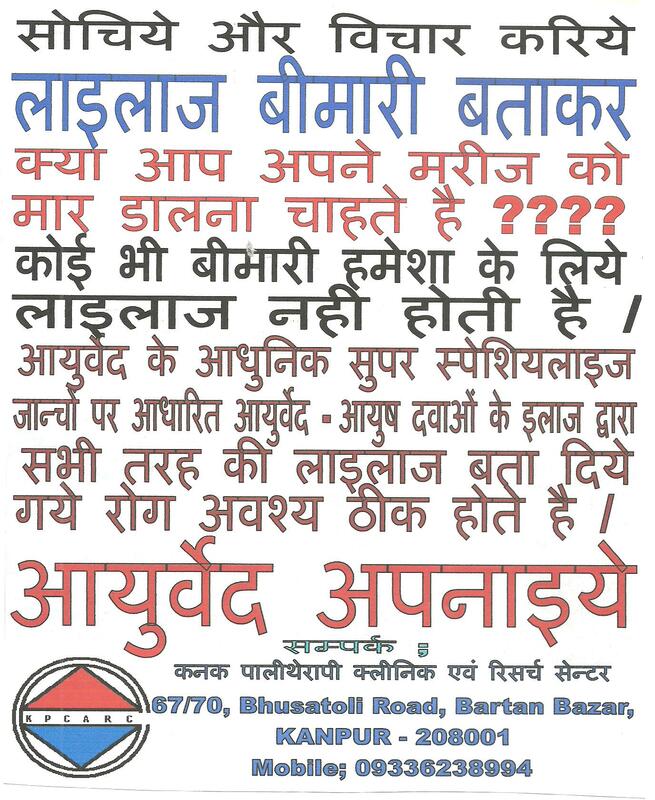 ANYBODY WHO WANT TO CONTACT TO THIS GENTLEMAN CAN TALK TO HIM AND VISITE PERSONALLY AS AND ACCORDINGLY. 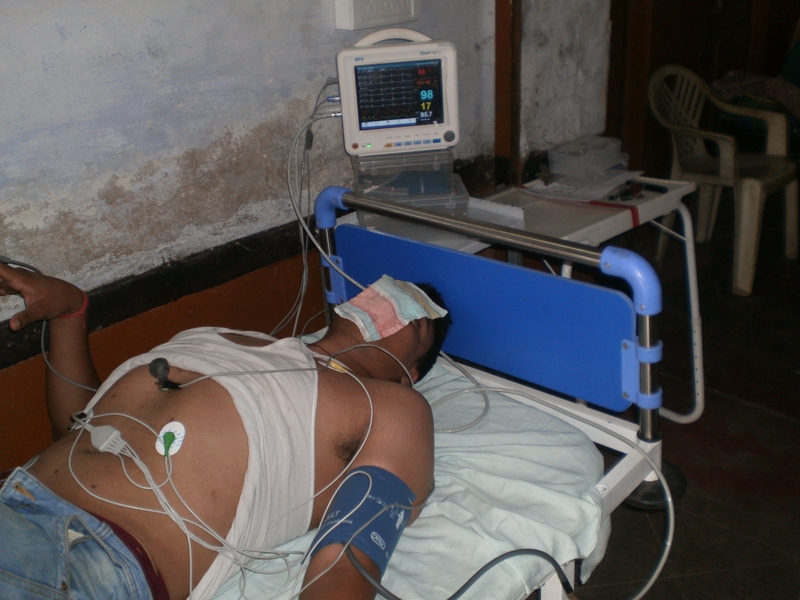 Mr DANISH KHAN – sufferred from dreaded disease condition AVASCULAR NECROSIS, is now fully cured by our AYURVEDA and AYUSH treatment and management. Danish Khan is living in LUCKNOW State capital of Uttar Pradesh . He assured me that he will response to all persons who is willing to knaow about the treatement and our procedures. We always believes and prefers evidence based Ayurveda and Ayush medical practice and as an example producing here the cured persons oral versions to all of you. We always face problems from patient’s side. 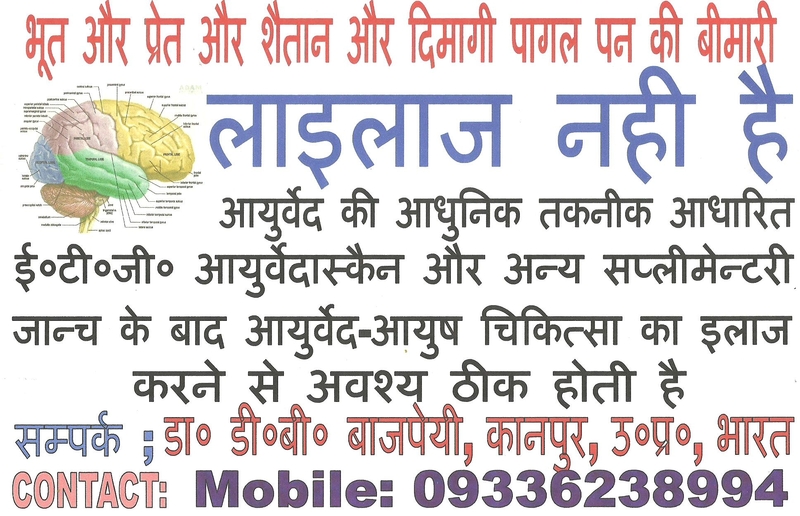 Large number of Incurable disease conditions are treated successfully at our research center of Epilepsy, Leucoderma, Paralysis, Diebetes, Heart disorders, Arthritis, Necrosis and many many disease conditions, cured patient are not willing to say or convey to others and avoide to talk to others. They want to hide waht have happened in past. This is one of the problem, which we faces all the times. एक मैगजीन मे मैने पढा कि IF YOU CAN NOT BE A KING , BETTER YOU BE A PHYSICIAN. 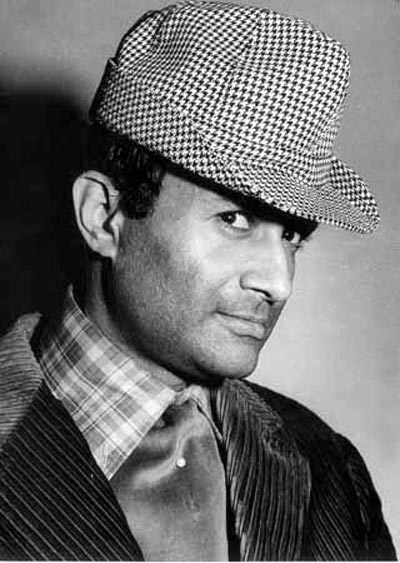 सुरैया की मौत के देवानन्द शायद मुम्बई मे ही थे / लेकिन देवानन्द सुरैया के अन्तिम सनस्कार मे नही गये / इसका कारण मेरी समझ मे यह आता है कि जब सुर्रैया और देवानन्द अन्तिम बार मिले होन्गे तो उन्होने यह ्प्रण किया होगा कि वे अब कभी भी एक दूसरे की शकल नही देखेन्गे और न कभी मिलेन्गे और अब उनके सारे रिश्ते टूट चुके है और यह भी कि कोई उनमे से दोनो का कोई एक भी एक दूसरे का मरा हुआ चेहरा भी नही देखेगा / यही बात समझ मे आती है कि देव साहब क्यो नही सुरैया के अन्तिम सन्स्कार मे शामिल हुये ? क्या भूत प्रेत का अस्तित्व आप मानते है ? क्या इस अखिल विश्व मे भूतो को किसी ने देखा है ? क्या बास्तव मे भूत होते है ?और क्या वास्तव मे हकीकत मे भूत किसी को परेशान करते है ? लौट के आते है फिर उस लडकी की बीमारी के बारे मे / लडकी के पिता ने बताया कि उन्होने लदकी का बहुत झाद़्फून्क कराया . जिसने जहा बताया वहा जादू टोना करने वालो के दरवाजे गया और मजरो मे मन्दिरो मे जाकर गन्डा ताबीज लाकर पहनाया गया लेकिन लड़्की की तबियत नही ठीक हुयी और दिन पर दिन उसकी हलात खराब होती चली / मै बहुत परेशान हो गया और घर के सन्ही लोग इस लड़की की बीमारी के कारण टेन्शन मे आ गये कुछ सूझ नही रहा था कि करे क्या > किससे इलाज कराये और क्या करे ? यझ बात सुनकर मरीज और मरीज के सभी साथ मे आये परिवार के लोग सन्युष्ट हुये / मैने उनको बताया कि सारे शरीर की जब जान्च होगी तब पता चलेगा कि शरीर के किन अन्गो की गड़बडी से यह बीमरी पैदा हो रही है ? यह तो अच्छा हुआ कि मेरे सामने ही इस लड़्की की समस्या सामने आ गयी / मैने लड़्की से पूछा कि क्या है ? तो वह भी मुझसे पूछने लगी कि कया है ? मैने अपनी आन्खे चढाकर उससे पूछा की क्या है ? तो उसने भी अपनी आन्खे चढाकर पूचा कि क्या है ? मैने कहा कि क्या भूत प्रेत परेशान कर रहे है ? उसने वही सवाल दोहराया कि क्या भूत प्रेत परेशान कर रहे हैं ? मैने कहा नही ? वह भी बोली नही ? आपके यहा आने से पहले इसका एक साल से अधिक हो गये है इलाज करा रहे है लेकिन यह ठीक नही हुयी / बुरी तरह से प्रेशान हो गये तब आपके पास आये . [BEFORE 250 YRS AND OVER , DR HAHANEMANN OBSERVED THAT USING CRUDE CHEMICAL BASED ELEMENTS AS A REMEDIES FOR TREEATMENT PURPOSES, WERE SULPHUR, MERCURY,ARSENIC,POISONOUS SUBSTANCES CREATS BAD EFFECTS ON HUMAN BODY AND LIBERATES PATHOPHYSIOLOGICAL CONDITION AS A SIDE EFFECTS OF THE USED REMEDIES.